With partypoker's recently announced "We're all in" initiative now underway we are delighted to continue our exclusive interviews with key members of the partypokerLIVE entourage with English tourney phenom and partypoker Ambassador, Patrick Leonard. Patrick Leonard is one of the most successful online tournament players over the past few years, reaching no.1 in the world in the PocketFives rankings in 2014. For the past couple of years Patrick has spent more of his time both running his successful staking company bitB Staking and, more importantly, helping establish the highly successful partypokerLIVE tours in his role as a partypoker Ambassador. Patrick when you joined partypoker back in early 2016 did you envisage the stable of thoroughbreds you’d be teamed up with less than two years later? I always knew the ambitious goals of the company. I think 2016 was the year of planning, 2017 was the year of meeting everybody at live stops and regaining trust from players and 2018 is the year where things really kick off in a serious way. These are exciting times for partypoker online and partypokerLIVE with the “We’re all-in” announcements. As an MTT pro the weekly guarantees online going from $4m-$10m and partypokerLIVE guaranteeing $200m in prizepools next season must make you extremely happy? I've been too busy working on the tournaments to have time playing them, but I actually played my first session last night and it was amazing. The guarantees are great of course, but I like the structures and the placement of the tournaments throughout the day. Around 2 years ago you could only ever get motivated to play Tuesdays and Sundays, now every day feels like a "special" day. Speaking of partypoker tournaments congratulations on winning the POWERFEST $1m guaranteed last month for $207k It must feel good to prove yourself to your sponsor in such a fashion? I don't really feel like I need to prove anything to anybody. This year in Vegas I managed to win 3 tournaments in the space of 7 days for $1.2m and then a month or so later won an online world championship. I feel more pressure proving myself as a businessman as everybody doubts you and thinks you're just another poker player who's going to lose all his money on some stupid ventures than in poker where I consider myself to be one of the best 3 players in the world. That win put you within touching distance of Conor Beresford for the UK no.1 spot on Pocketfives. Do you think you’ll ever put in enough volume to make it back to no.1 in the world (Patrick made world no.1 in 2014 just a year after swapping cash games for MTT’s) or do you think your live and business commitments will make that a tough ask? It actually put me first in the UK for the next month or so and 7th in the world. I was only playing 1 day a week, but leaderboards motivate me, perhaps I go hard for the next 6 months with my friend Samuel Vousden and try and be number 1 and 2 in the world. Loved your tweet about Isildur1 flipping you for his last couple of hundred euros at MILLIONS Germany in Rozvadov after losing all his money to Gus at Chinese Poker days before he went on to win the main event for €1m. How much of a total and utter legend is Viktor Blom?! Who knows if that was his last money or the only money in Rozvadov or if he didn't want to top up that day etc. He is obviously one of the biggest legends in poker, he is great for the game, plays anybody, anywhere, any game for any stakes. 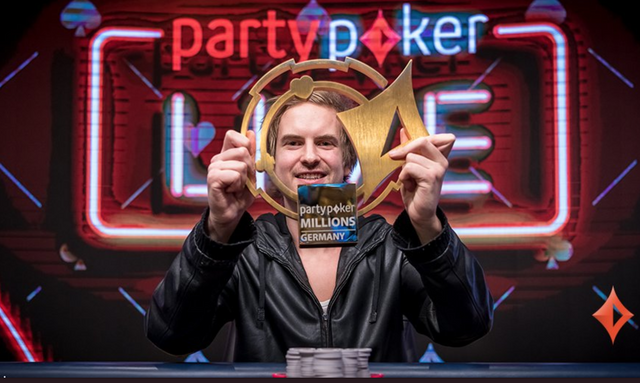 Above: Patrick recently flipped a hand for a few hundred euros with Viktor "Isildur1" Blom at partypokerLIVE MIllions. A few days later Blom walked away the winner of the €5k Main Event for €1,000,000. Who, in the poker world did you look up to on your way up? I used to look up to Tom Dwan, as I got older I looked up more to the guys who were successful in business. In the end very few guys managed to be super successful in both poker and poker business. I'd like to be the very best in both. Who do you consider to be the best tournament player in the world today? In preparation for this interview I had a look through your achievements online and live and was struck by the insane few days you had in Vegas last July when you won back-to-back Aria $25k’s AND the $10k Bellagio Cup for $1.3m, with all three tournaments starting between 10th-14th July. Did you do anything crazy to celebrate that weekend? No. I don't party, don't really drink, don't take drugs or let loose really. I went for dinner with my friend Jason McConnon, we had both had tough Vegas's prior to this week and got a quiet night. I was just excited to get back online and studying/grinding. Although I had played well in summer 6 weeks off without piosolver and other education tools means your game will be falling behind guys who are working every day. I hate the feeling that somebody is working harder than me, it almost makes me feel sick. You’ve been known to be pretty successful backing other players and I notice your company bitB Staking is ever expanding into new territories – how do you manage to maintain a work/life balance with so much going on? You just have to get used to working 16 hour days. I sleep around 8 hours and the rest of the day I'm working, hustling, grinding. I don't really watch TV and unfortunately I let work take over my health a little bit. My goal for the next couple of months is to eat better and play more sport. Whenever you want to be successful you have to make huge sacrifices, it's important to reflect and change subconscious bad habits once you realise they are not GTO. Power rankings: Top 5 online tournaments players? Top 5 live tournament regs? Rudest poker player you have ever met? Where is "our combined graph"?